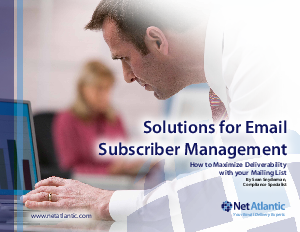 Net Atlantic's whitepaper, "Solutions for Email Subscriber Management" covers several ways to manage your subscribers to maximize deliverability, including permission options, suppression files, re-engagement campaigns, and more. Your relationship with your clients is the most important factor in your success. A good email service provider should provide you with the tools to help you engage your subscribers successfully. Discover how improving your subscriber list management techniques will improve deliverability, response rates and your enterprise. In this whitepaper, learn the problems that exist in list management, how to resolve the problems and improve your list.